This has been an excellent week in terms of lectures and conferences. On Wednesday evening, the second of the Canterbury Historical and Archaeological Society’s winter programme of lectures took place when Dr Doreen Rosman gave a fascinating talk about Elizabeth Barton, the Holy Maid of Kent. Firstly, a couple of notices, and I’ll be giving more information next week about the Centre’s joint conference with Kent Archaeological Society on ‘Place Names and Family Names’. This conference will feature Dr Paul Cullen, probably well known to many of you, and who is a contributor to Early Medieval Kent, 800-1220 (see the blog a few weeks ago). At this point do please make a note of the date: Saturday 12 November, and tickets can be booked at: https://canterbury.ac.uk/arts-and-humanities/events/events-list aspx Secondly, the ‘Tudors and Stuarts History Weekend’ website is now live at http://www.canterbury.ac.uk/tudors-stuarts and do have a look if this sounds interesting. Do please remember if you encounter any difficulties that the box office will not be staffed until Monday morning but will then be open from 10.00 on 01227 782994. However, you can use the email address of artsandculture@canterbury.ac.uk and again the staff will get back to you on Monday. This week I want to feature two medieval lectures I heard at Faversham and Canterbury respectively that again highlight the richness of Kent’s medieval heritage and how this is of interest to many within the county. On Tuesday, I joined a crowd of people who packed into the parish church of St Mary of Charity at Faversham to hear Professor Paul Biniski from Cambridge discuss the wall paintings in the north chancel chapel. Professor Biniski’s expertise in art history is well known, and he has worked on the decoration in many of the great cathedrals, including Westminster Abbey and more locally Canterbury Cathedral. He has also studied wall paintings in parish churches, especially those of East Anglian that hold some of the best examples in the country. Consequently, Faversham was exceedingly privileged to have him as a speaker and hopefully his presence will raise the profile of these important paintings. The problem relates to their position because they have been largely hidden by the organ that almost totally fills the chapel. At a result, only one figure can be seen and even he is not very clear. It has been suggested that the organ should be moved again to reveal the paintings, which will also mean that they can be conserved. So what will we see if this happens? As Professor Biniski said, there are three saints who are linked to English national identity: St Edward the Confessor, St Edmund king and martyr and St Thomas of Canterbury. In addition St John the Evangelist, disguised as a pilgrim/beggar, is on the opposite side of the arch to St Edward because the king is said to have given a ring to him as an act of charity. Such an act might recall the division of his cloak by St Martin when he gave half to another beggar at the city gate – see Dover’s medieval town seal. To return to Faversham, as Professor Biniski mentioned, St Edward received particular acclaim in the 13th century because of Henry III’s considerable devotion to this penultimate Anglo-Saxon king of England, known for his wisdom rather than his martial prowess. Henry III’s devotion led him to construct a fantastic shrine to the Confessor in Westminster Abbey and further work at the abbey is similarly some of the best medieval decoration in England from this period. Now, as he was keen to point out, Faversham is not in that league but it is still exceedingly good. Furthermore, the late 13th/early 14th century is known for its especially graceful wall paintings. In terms of the execution of the paintings, I was very interested to hear that the painter of those figures in the chapel had used water-based paint, but Professor Biniski thinks the ones on the octagonal column are probably in oil paint. As well as the wise king and one of Christ’s companions, the inclusion of St Edmund who met his end trying to defend his kingdom of East Anglia against the Vikings would have been a powerful reminder to those visiting the chapel of other aspects of kingship, including his willingness to sacrifice himself for his people. This sense of sacrifice might also apply to St Thomas of Canterbury in that he was exceedingly popular among the people of Kent, who seem to have seen him as some sort of people’s champion. Paul Biniski thinks there may be a representation of the martyrdom somewhere on the wall, which would be another good reason to move the organ. Moreover, as in some stained glass, there also appears to be a painting of a donor. Robert Dod kneels with a prayer scroll under a very fine canopy and what is especially intriguing is that only two of the saints are mentioned in his prayer, and not St Edward. Thus, it is feasible that there was (or hopefully still is) another donor painting somewhere nearby. With such fascinating insights into these wall paintings, Professor Biniski captivated his audience and Faversham could be moving into a very interesting period of discovery. My second event took place at the Canterbury branch of the Historical Association where Richard Eales, formerly of the University of Kent and now of Canterbury Christ Church, provided an assessment of the Norman Conquest and its aftermath, with special reference to Kent. 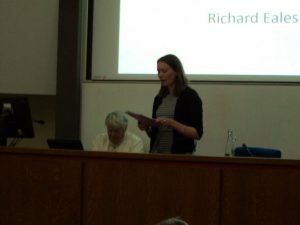 Richard drew on a whole range of sources from chronicles (Norman and Anglo-Saxon), charters, archaeology, Domesday Book, and the Bayeux Tapestry. In particular, he used the latter to provide a narrative of events from the last years of King Edward the Confessor through to the arrival of William’s fleet of ships in England, the feasting of the invaders when on shore at the expense of the English peasants and the battle itself. Because I am on a hunt for medieval representations of the pig, I was particularly delighted to see that one poor pig was the victim of the Norman foragers. Richard then offered an assessment of recent ideas regarding Duke William’s march through Kent via Romney, Dover and Canterbury as he initially took the coastal route on his way towards London, as well as a further force heading to Winchester to collect the royal treasure. He highlighted, using the Domesday Book, those areas that had seemingly suffered most at the hands of this invading army, although, as he said, such evidence is not clear enough to be able to deploy to map the Norman route through Kent with a high level of precision. Nonetheless, he showed that east Kent had experienced considerable destruction during this early period, but, of course, nothing on the scale of William’s ‘harrying of the North’ somewhat later. Yet, as Richard pointed out, resistance to the Normans was regionally or locally based which meant that any chance of success was severely limited. Moreover, the vertical and horizontal internal divisions within English society similarly hampered a concerted response, thereby enhancing William’s position as he set about a major redistribution of English lands. Landholding in Kent was a major feature of the later section of his lecture and Richard noted the level of church ownership and its continuity from Anglo-Saxon times and into the period of the Norman kings, something that makes Kent different from many other regions. He similarly observed the role of Bishop Odo as a major landholder and how this can be seen as a royal subcontracting arrangement, in some ways not dissimilar to the role the Godwine family played during Edward the Confessor’s reign. Not that this was still the case in 1086 because Odo’s rebellion against his half-brother has led to his exile and his vast estates passing under direct royal control. This and Odo’s subsequent rebellion meant that in broad terms half of the county was held by the Church and much of the rest was in the hands of large numbers of minor baronial families. Being an expert on castles, Richard provided an overview of Kent castles. He noted the role and form of the three royal castles of Rochester, Canterbury and Dover, including Canterbury Archaeological Trust’s recent findings regarding the extremely large extra-mural bailey at Canterbury, and then briefly turned to the mass of castles constructed by Odo’s and Archbishop Lanfranc’s sub-tenants. Like Professor Biniski, Richard Eales provided a fascinating analysis, which similarly drew a number of questions from his attentive audience. Furthermore, Richard’s talk was especially appropriate considering we are now just a matter of days away from the big anniversary. Thus for medievalists in Kent this has been a good week. Firstly, thank you to everyone who has been in contact with Ruth Duckworth using the artsandculture@canterbury.ac.uk email address to register their interest in the Tudors and Stuarts History Weekend next April, the website is almost complete. I know I said that a couple of weeks ago but we then ran into a couple of issues. However, these have been almost completely resolved and things are moving on towards completion. Consequently, I am hopeful that we will indeed be up and running within the next ten days and as soon as we are I shall post the news. Moreover, Ruth and her colleague will also be in touch to give you the good news if you have given us your email address. More good news, Dr David Starkey will again be giving a lecture at the Weekend, and next year it will be on the afternoon of Saturday 1 April. I shall not reveal the title at this stage, but just say it is topical. Another date that I would suggest that you reserve if you live in or around Canterbury is the evening of Tuesday 6 December, because this will mark the relaunch of the Centre that will be moving from its ‘home’ in the School of Humanities to a new ‘home’ in the Faculty of Arts and Humanities. To highlight this event the Centre’s new Visiting Professor Paul Bennett will be giving an open lecture. As many of you will know, Paul Bennett is the Director of Canterbury Archaeological Trust. He is an expert on the history of Canterbury, and an authority on Libya’s classical past. In terms of the Centre, Professor Jackie Eales will remain as one of the heads but Dr Stephen Hipkin will be stepping aside and Professor Louise Wilkinson will be joining Jackie. This will have the merit, among other things, of giving the Centre direction from both a medievalist and an early modernist. Furthermore, it will then come within the orbit of the Dean of the Faculty and some of you will remember him from the blog last week – reports on the medieval buildings of Canterbury and the Ian Coulson Prize winners at the Nightingale Lecture. A further date I would recommend you reserve is Saturday 12 November for the joint Centre and Kent Archaeological Society ‘Place Names and Family Names’ conference. This will feature the expert on Kentish place names Dr Paul Cullen of the University of the West of England. Some of you may have seen Paul’s work in the final chapter of Early Medieval Kent, 800-1220 where you can explore a large sample of place name elements to be found in the place names of Kent. Paul will be giving two of the lectures, including one on field names, a very interesting topic. Paul will be joined by Dr Michael Bintley from Canterbury Christ Church, an expert on Old English literature, and Elizabeth Finn, an archivist at the Kent History and Library Centre at Maidstone. 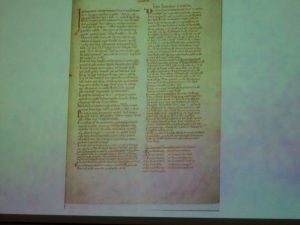 Elizabeth Finn is working on a project to locate all the medieval manorial records for Kent and she will discuss the various place names she has discovered during her research. Others among the Centre have also been busy and Professor Wilkinson has recently been at conferences in Dublin and Gloucester. The latter was at the cathedral and while there, she had a chance to look at some of their medieval documents. What particularly took her attention was Gloucester Abbey’s medieval charter collection (the abbey church became Gloucester Cathedral in 1541, the area previously being within the see of Worcester) that has been preserved in a series of scrapbooks. However, this is not as detrimental as it sounds as the charters were carefully fixed into these bound volumes and the seals have been protected by cutting out blocks within the pages. As a result, there is plenty of room for the seals and the charters are in a beautiful monkish hand. Among those produced for women as grantors to the abbey was one that involved beehives and there is a little drawing of a beehive at the start of the charter – a lovely touch. Centre members have not only been giving lectures but they have been attending papers too. 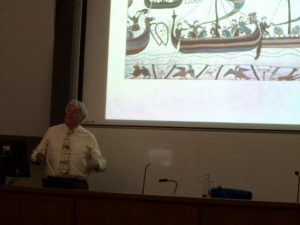 Like Dr David Grummitt, the Head of the School of Humanities, I was in the audience on Wednesday when Professor Steven Gunn gave the first History Research lecture at the University of Kent. Professor Gunn is the joint head of an ESRC-funded project to look at coroners’ inquests produced across England in the sixteenth century. In total, there are 9000 inquests and the various details are being recorded on an Excel spreadsheet to produce a searchable database. Professor Barbara Hanawalt completed a similar project on medieval inquests several decades ago but the difficulty in that case was that such coroners’ records only survive for a few Midland counties. Professor Gunn has a far larger topographical coverage because, even though some counties may be under represented, the only counties without these returns are Durham, Lancashire and Cheshire – such areas were governed differently. The London records are not complete either. I do not have space to give you more than a couple of examples but Professor Gunn provided a whole host of examples that illustrated, among other things, the dangers women faced collecting water, whether from wells or rivers, and the likelihood of carts over turning and crushing or otherwise fatally injuring either the driver or passers-by. Two of the Canterbury examples from 1519 and 1524 involved such cart accidents, the victims being Martin Hilles of St Dunstan’s and a three-year old girl called Alice Sigemond. Another Canterbury victim was Henry Byngham, esquire, who died in the fire at the archbishop’s palace in 1543. For those from the west of the county, it is perhaps worth recounting the fate of John William, the servant of David Wyllard of Hadlow, who died as the result of an accident at a blast furnace. Such colourful examples are very seductive and if you want more of these, Professor Gunn mentioned that he has written several articles for the BBC History Magazine. However, there remain methodological issues surrounding what is still a relatively small number of cases in terms of the overall population over a century, as well as concerns whether these provide evidence of the norm or the abnormal. But I’ll leave you to consider this and instead hope to be able to give you definitive news regarding the Tudors and Stuarts History Weekend next week.